Believe it or not, presentation nerves come from our prehistoric history. Have you ever stood up in front of an audience, about to give a presentation, and forgotten everything you wanted to say? Or have you seen someone go red, shake, or say something bizarre in the first seconds on stage? A presentation environment is not a naturally comfortable situation: that’s because as cavemen, you on your own in front of an audience could mean you’re about to get eaten. In that situation, we’re programmed to react with instinct, not reason. Instinct kicks in and tells us, “You are under threat!” We’re pumped with gulps of adrenaline, our temperature goes up and a part of the rational brain is disengaged. Everything is preparing you to make an instant, unthinking decision – Fight or Flee. It’s literally as if the body is telling us the audience are a group of animals, going for our blood. The resulting bodily reactions can be disastrous: get off to a bad start and your presentation may be much worse than with a good launch. The key is to get your body to stop panicking and to realise there is no threat. Most audiences are not out to get you – in fact most are willing you to succeed. If you can deliver the first 60 seconds of your presentation calmly, from memory, your instinct is told, “Don’t worry! There’s no threat, we’re in control here.” Your instinct gets this and lowers your adrenaline, enabling your body temperature to normalise and your reason to kick back in. Back in control, you’re able to deliver the rest of your story with confidence. Does this mean you should learn your whole script? Absolutely not… more on this to follow. 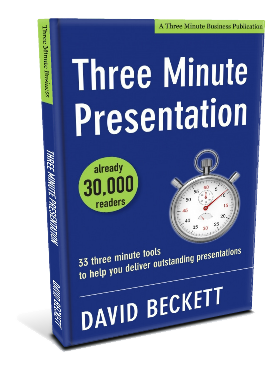 in Three Minute Presentation by David Beckett.